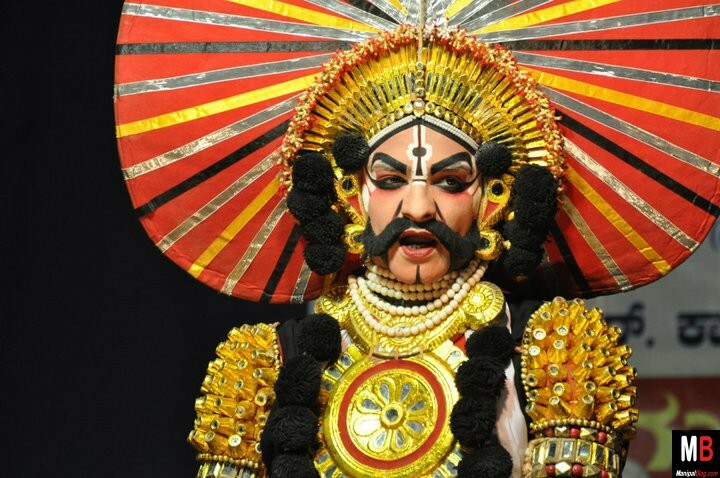 HomeUncategorizedScintillating Saturdays: Yakshagana Musical dance drama! It’s evening in Dakshina Kannada. The place may be any of the smaller towns or villages, bathing in the dying embers of the setting summer sun. The paddy fields have been laid barren after the cutting and shearing of the crops from the last monsoon. The paddy has been de-husked and there is a deliciously faint smell emanating from the large vats of boiling paddy being processed for future use as boiled and steamed rice. Tired villagers are washing away the sweat and grime of the days work. In a field not far away the stage is being readied. A 16′ X 12′ area is being marked in a harvested paddy field and decorated by a group of men. Gorgeous costumes befitting the epic heroes have been designed by anonymous artists of yore. Soon, simple dance steps will be depicting tales of mythology and as a concession to the present generation, tales from today too! The audience will trek to the show from 10 to 12 kms away, hearing the loud beating of the Chande or drum. Plays commencing around 9.00 p.m. will last until the early dawn, children will frolic in the darkness, the puffed up rice mixed with curry powder, green chillies and tomatoes will be keeping them occupied, while the adults will listen intently to the narration on stage. At first light, the few who are still awake, will awaken those who dozed off, and the stage will be quickly dismantled and another day of work begins! 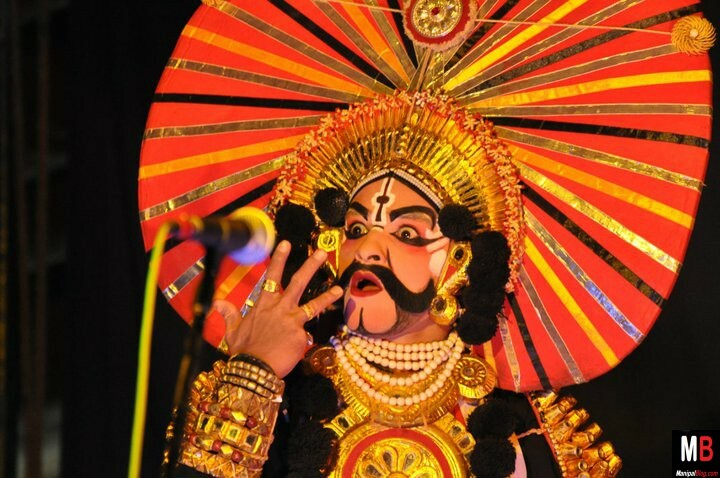 Yakshagana, like many other forms, defies neat classification into categories like folk, classical, rural. It can be included into each of these, or all of them together depending upon our line of approach. Coming down as a heritage since the 15th century, Yakshagana has been perfected as a complete theatrical form being played for six months in a year to regale, instruct, and edify the rural masses. Being a theatre form, unlike a dance form, it is more plural and dynamic. And hence it exhibits many types and varieties inside itself. 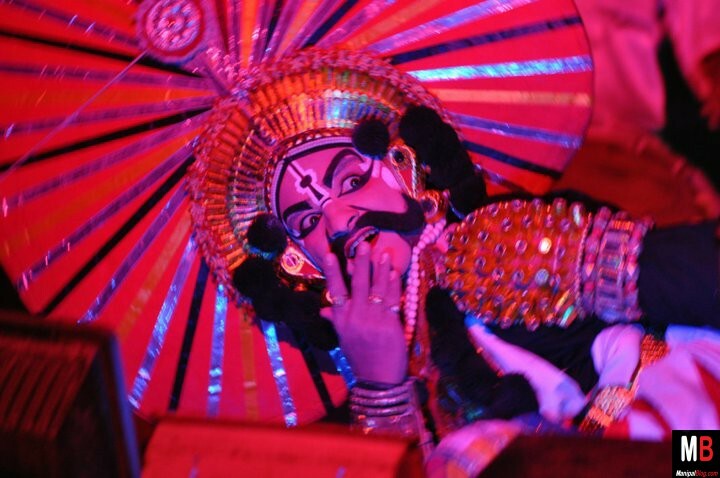 However, Yakshagana can be rightly a traditional theatre form combining dance, music, spoken word, costume-makeup, and stage technique with a distinct style and form. 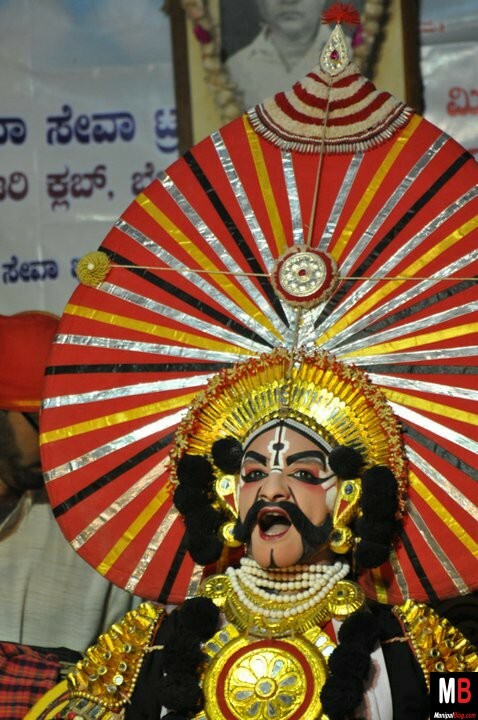 Both the word Yakshagana and its world are both interesting and intriguing. It is a theatre form mainly prevalent in the coastal districts and adjacent areas, in Karnataka. It is closely connected with other forms prevailing in other parts of Karnataka, and its neighboring states of Andhra Pradesh, Kerala, Tamilnadu and Maharastra. Primarily it is a name given to the one prevailing in Coastal and Malnad areas of Karnataka, though in fringe forms like Doddata are also called by the same name often, especially recently. 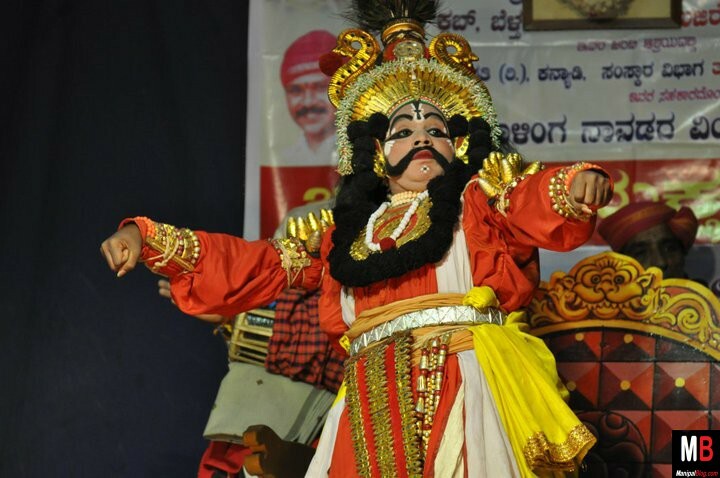 The traditional theatre form Mudalapaya of Southern Karnataka, the Doddata of Northern Karnataka, the Kelike in the borders of Andhra, the Ghattadakore of Kolgal in Mysore district – are such forms. Among them, the Ghattadakore is a direct branch of Coastal Yakshagana while Mudalapaya is the most closely connected form. There is a form called Yakshaganamu in Andhra Pradesh also which exhibits resemblance to the forms of Karnataka plateau region. Face Paint and Awesome Dialogues…. Yakshagana as a theatre form from Karnataka in earlier times used to be called Bhagavata Ata in both Kannada and Tulu, which simply means the Universal Play. Yaksha-gana literally means song of Yaksha (a tribe in ancient India). 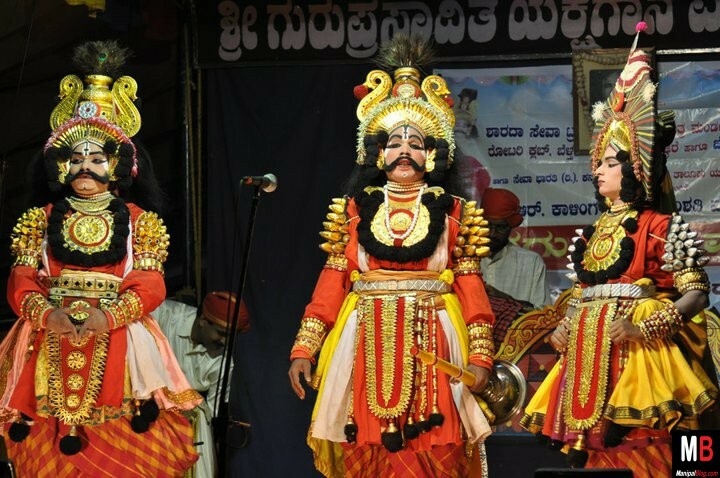 Yakshagana consists of Himmela (background musicians) and mummela (dance and dialogue group) who in coordination perform a Yakshagana prasanga (story). In the coastal districts of Karnataka – Uttara Kannada, Udupi and Dakshina Kannada – two distinctive styles of Yakshagana are prevalent, the Badaguthittu (or northern style) of the Uttara Kannada and Udupi districts, and the Tenkuthittu (or southern style) of the new Dakshina Kannada District. The musical style, the costumes, the musical instruments and the dance patterns are markedly different in the two schools, but all the elements of the theatre are present in them – a musical ballet dance drama which uniquely blends powerful music, vigorous dance, colorful costumes and extempore dialogue. The stories of Indian mythologies –the Ramayana, Mahabharata and the Purnanas with their world of Gods, Demons and super human beings are artistically depicted. The actors dance and render extempore dialogue as Bhagavatha – the main singer sings padyas (Ballads) written by Poets of bygone years. He is accompanied by musicians who play traditional musical instruments in the background. The instruments used are maddale, taala (bells), chande (loud drums) and harmonium. Colors and Expressions that Enthrall…. The actor narrates the same story through his dance. The music is Yakshagana Raga and Yakshagana Tala, both of which have folk influences. 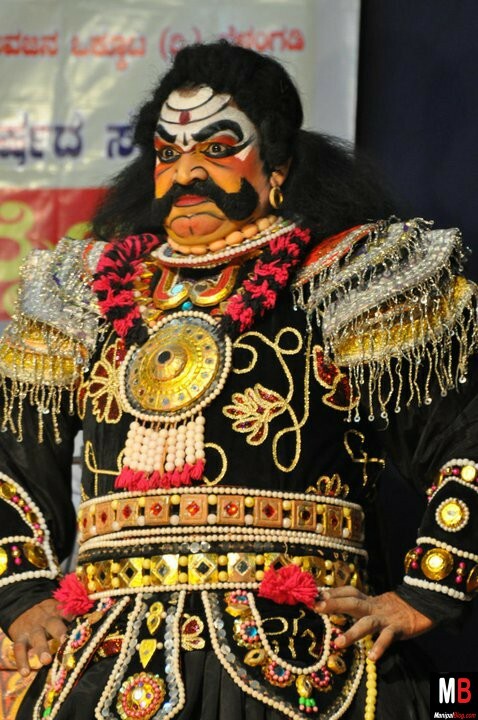 The costume (Vesha) depends upon the character being depicted in the play and the Yakshagana style. The costume consists of the kirita or pagade on the head, the kavacha on the chest and bujakeerthi on the shoulder. Facial painting is an important part of the costume and depends upon the character being portrayed. The plays have no prescribed structure; the poet writes in his own pattern as the story shifts from one episode to another, yet most stories climax with a battle or a battle followed by a marriage. The enacted stories called prasangas are usually drawn from epics like the Ramayana, the Mahabharata and the Bhagavatha. Gorgeous costumes befitting the epic heroes have been designed by anonymous artists of yore. Simple dance steps are worked out fully in a wonder world of fantasy. Dialogues, spoken extempore, keep rural audiences spellbound. A touch of contemporary reality is given by the clown Hasyagara who wags his tongue at a rustic level. The confluent presentation of the story is always subject to interruptions; clowns interpolate comic scenes throughout the performance; major characters not introduced at the introductory dance, perform their own introductory dance (oddolaga) prior to their entry into the story; and particular situations in the drama such as the travelling of characters from one place or country to another, or warfare and battles, are depicted by the convention of characteristic steps and dances. Love is in the Air?? All photographs courtesy – Gopinath Prabhu.